The funds will help support the development and implementation of five core services for the Nelson Innovation Centre. 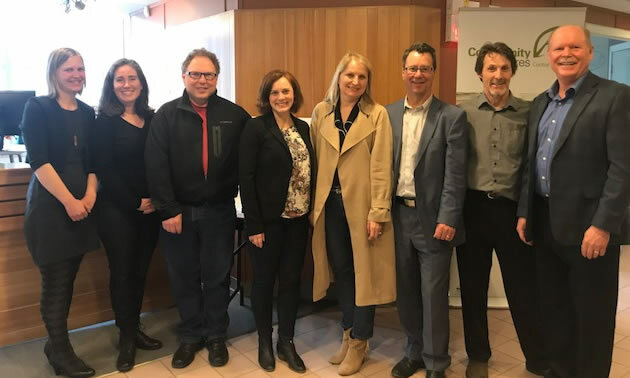 MLA Michelle Mungall and several local dignitaries gathered Tuesday afternoon in Nelson as the BC Government Minister presented Community Futures Development Corporation of Central Kootenay with a $100,000 grant from the BC Rural Dividend Program. The funds will help support the development and implementation of five core services for the Nelson Innovation Centre including vital access to capital and business start-up programs. The ceremony and announcement on behalf of Doug Donaldson, Minister of Forests, Lands, Natural Resource Operations and Rural Development, was held at the Community Futures Central Kootenay, and included Paul Weise of Community Futures, Rose Hoeher of Innovation Council, Tom Thomson, Executive Director of the Nelson Chamber of Commerce and City of Nelson manager Kevin Cormack. “By helping local people deliver projects they know will make a real difference for their communities, we are building a foundation for healthy, robust and sustainable economies across our region,” Mungall stated in a media release. “Projects like this demonstrate how we can support the amazing creative projects that are taking place in rural communities like ours,” added Mungall, who is also the BC Minister of Energy, Mines and Petroleum Resources for the current NDP Government in Victoria. Including the funding granted to the Nelson Innovation Centre, under the BC Rural Dividend Program, the Government of British Columbia is providing $1,424,303 for nine projects in the Kootenays. “These great projects show how we can harness the immense creativity in our rural communities,” said Katrine Conroy, MLA for Kootenay West. The funding is part of nearly $8 million in 58 project grants being awarded to eligible local governments, First Nations and not-for-profit organizations through the BC Rural Dividend Program. Rural dividend grants help fund projects that that will stabilize rural economies. Grants can be up to $100,000 each, or up to $500,000 each for partnership projects. The rural dividend encourages economic diversification, innovation, sustainability and collaboration, and recognizes the diverse needs of individual communities. Learn more about the BC Rural Dividend Program HERE.